Stretching the One Income Dollar: Review: Babyliss Pro Diamond Titanium Ultra Flat Iron 1"
Review: Babyliss Pro Diamond Titanium Ultra Flat Iron 1"
My daughter Erika loves straightening her hair,and she feels like "yuck" if she doesn't. Erika is 19. 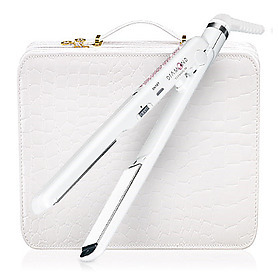 She happily reviewed the Babybliss Pro Diamond Titanium Ultra Flat Iron 1" from Flat Iron Experts. They have a huge collection of the best flat irons and other hair styling products. We both wowed at the looks of it-pure white with the handle covered in a nice collection of dazzling Swarovski Crystals.The straightener itself glided through her hair and kept a consistant temperature.Buying a quality flat iron sure makes a difference that buying one from your local big box store. With a temperature that reaches up to 450 degrees, this flat iron will straighten your hair quite nicely.